TROMBETTI FLORIDA REAL ESTATE: Call Or Text Me Any Time! (239) 560-1574 *** 14th Year Helping Families Find Their Florida Dream Home! Call Or Text Me Any Time! (239) 560-1574 *** 14th Year Helping Families Find Their Florida Dream Home! Many buyers are now families or young couples with a baby on the way. They don't want to rent but can't afford to buy a house. Or some, regardless of age, don't have the time or inclination to maintain a home. Designer Sabrina Bitton, an expert in all things space saving and clever, recently transformed her 825-square-foot suite into a showpiece of good, functional, flexible and space-efficient design. Her suite offers the clean-lined and less-is-more sensibilities today's buyers want. The kitchen includes walnut shelving and a walnut island. To create maximum storage space, Bitton took advantage of the nine-foot-high ceilings and extended the built-ins to the ceiling. The high space is ideal for storing large boxes of out-of-season clothing and seasonal items that don't need to be accessed on a regular basis. 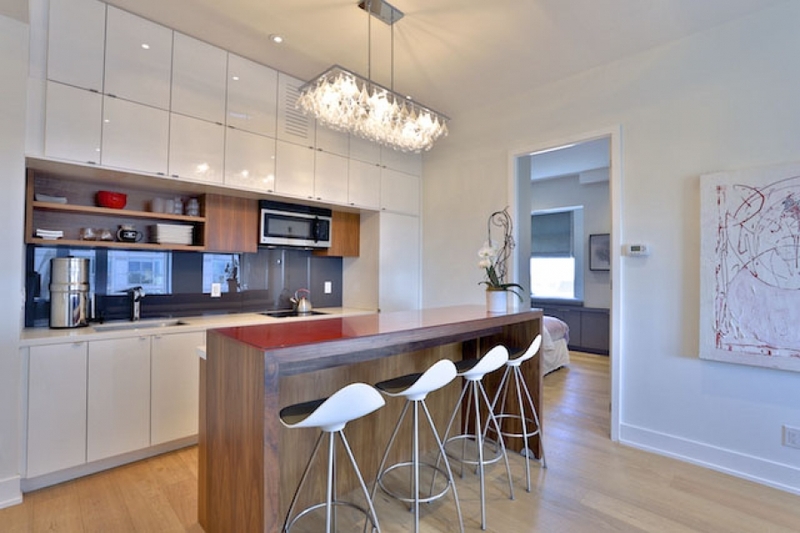 Storage space is always a challenge in condos, so finding creative ways of adding more makes the unit more functional. "I have so much storage space that some cupboards are actually empty," she says. A clever "Bitton trick" is a bar-height island on wheels that fits over the existing kitchen island so it doesn't take up additional floor space. Downsizers who aren't ready to give up their sit-down eating space find this a particularly welcome idea, Bitton says. She chose bar stools with lower backs so when they're tucked under the bar, they don't obstruct the view from the kitchen. Bitton added a clear rectangular blown glass chandelier over the island to add drama without distracting from the view. "Comfort is important. Also, since it's a linear space, the curved couch adds a feeling of movement. You could also add an additional sleeping area by using a sofa bed." In the bedroom, the original closet doors were removed and the closet space was lined with walnut to create a headboard/nook for her bed. The window seat was extended from 18 to 24 inches to create a cosy sitting area. Custom built-ins were installed below the window seat and extended along the wall. An unused alcove space was filled with shelves and glass doors to create a fun display space for Bitton's fancy shoes. Before buying a new condo, Goodchild says it's important to speak to the builder to find out what changes can be made. You may not want the kitchen that's there or would prefer to omit a wall, but the builder may not be able to accommodate your needs. Few developers will allow preconstruction changes. In that case, choose the least expensive finishes for features you plan to remove, and then renovate with an eye to creating functional and multi-functional space, says Bitton, of Sabrina Bitton Interior Design. "It's all about creating smart condos." "Retirees still make up a large percentage of purchasers, but the under 35-year-olds find condo ownership appealing because they want to be downtown and be close to work. They want to have the ability to work, live and play in the same neighbourhood," Goodchild says. "Then they have children and sometimes stay."